At last! 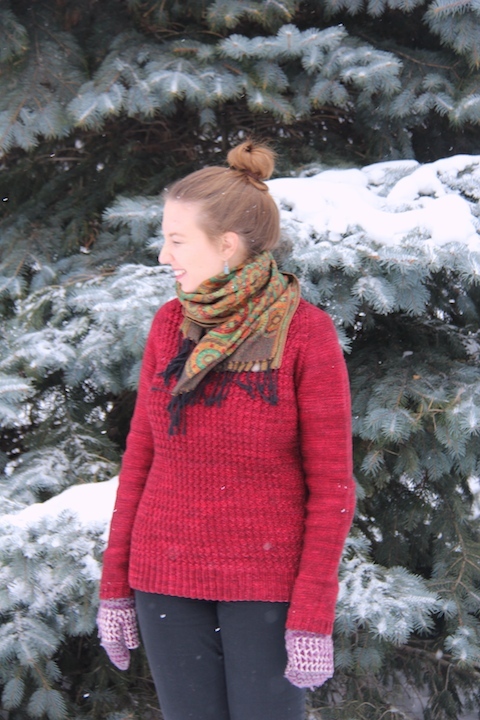 I feel like it took almost as long to get photos of this sweater as it did to knit it! That’s an exaggeration, but the knitting really did feel like it was flying. Plus, I didn’t want to wear it until we’d taken photos (just in case), so Bedford sat finished and folded for a week before I finally got to wear it (and yes, I’ve been wearing it a fair bit since then). This is the big, cozy sweater of my mid-winter dreams. I knit this with the intent to have something slightly oversized (for layering) and that is exactly what I got (I was aiming for 3-4 inches of positive ease and got 6, which I’m okay with). It is perhaps not the most figure flattering sweater, but the stretchy texture of the all-over stitch pattern means that it isn’t shapeless or too tent/sack-like, which is what holds me back from knitting other oversized sweaters like Benton and Boxy, which I admire from afar. Bedford, for me, fits that perfect middle-ground usually reserved for a favourite sweatshirt: oversized without looking too big, with the bonus of being a sweater I can happily wear out of the house. 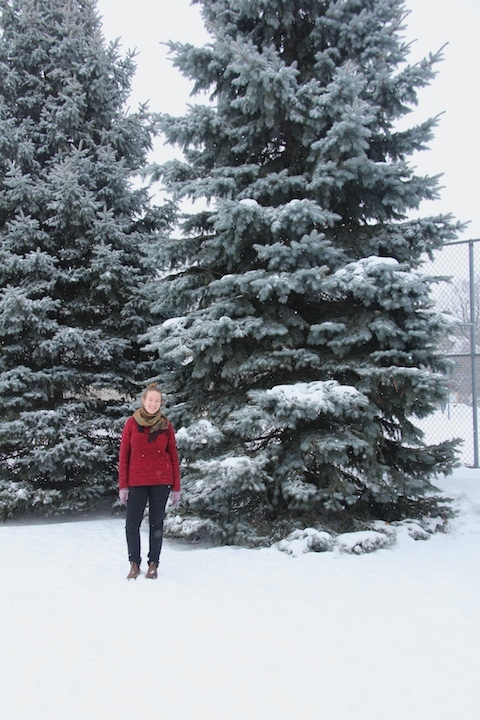 Speaking of which, when we shot these photos it was -4C (about 25F) and snowing, and I wasn’t really cold. Obviously I left my scarf and mittens (these ones) on, but otherwise I was okay. I expected to be shivering and asking L to hurry up, but Bedford is surprisingly warm! It is a worsted-weight sweater, but I’d say it’s warmer than my Woodstove Season cardigan, which is knit at a similar gauge and in a similar wool. All that texture really pays off warmth-wise without making it way too hot to wear indoors (so far I’ve worn Bedford around my apartment, out to a restaurant, to an art gallery, and to work, and nowhere have I been uncomfortably warm). Construction-wise, I pretty much followed the pattern exactly. Knitting the sleeves inside out (which is to say, in stockinette rather than in reverse stockinette) worked out just fine — I just turned them right side out when it was time to join them to the body and there were no issues. I actually really like the look of the reverse-stockinette sleeves, so I might try this again on another sweater, just for fun. I also added fake-seams along the raglan lines. In the pattern, there are two stockinette stitches along the raglan lines, so I added a purl stitch in there (k1, p1, k1), which I then closed up exactly the way Karen describes in her tutorial. This is a heavy sweater, so I’m glad to have a bit of reinforcement along the lines where a lot of the weight hangs. I had to change a few things in the raglan shaping/neckline to get the decreases to line up with my row gauge. I don’t remember exactly what I did, but I do know that I worked the raglans for 6 inches before binding off the initial neckline stitches (if I’d stuck to the pattern, this would have had quite a scoop neck). I also tried a new method for binding off the neckline stitches and I’m really happy with the result (my scarf kind of covers it up, but you can see the neckline in the photo in this post). It made for a very smooth bind-off, which in turn made it very easy to pick up the stitches for the ribbing. I will absolutely use this method going forward. Notes: Besides what I’ve already mentioned, I added a few inches to both the body and sleeves. I also knit the sleeve ribbing on a smaller needle, in an attempt to avoid baggy cuffs. I didn’t totally succeed, but it turns out that reverse-stockinette is the perfect folding fabric. That is, usually I just push up my sleeves, but it turns out that if I fold these back the purl bumps grip each other quite nicely, so fitted cuffs aren’t such an issue. If I were knit this again (you never know), I would knit the bottom ribbing on a smaller needle too, just to give it a little more structure. Anyway, you see notes and whatnot on Ravelry, here. I am itching to cast on another sweater, but haven’t yet found the perfect yarn for Epistrophy (I have some swatching to do), so I’ve decided to stick to small projects for the rest of February. I’m trucking along on my Dawlish socks, and I wound some yarn for new mittens, and I could use a new cowl. Basically, before I commit myself to another big project, want to get a revel in finishing some things first. That’s a kind of balance, right? Lovely! What a warm color! Looks just as lovely on as it did in your last post. That is lovely! The color is so perfect for winter and I’m really digging the texture. That textured stitch is definitely what made this such a quick knit! It was way more fun than plain stockinette. what a great sweater! 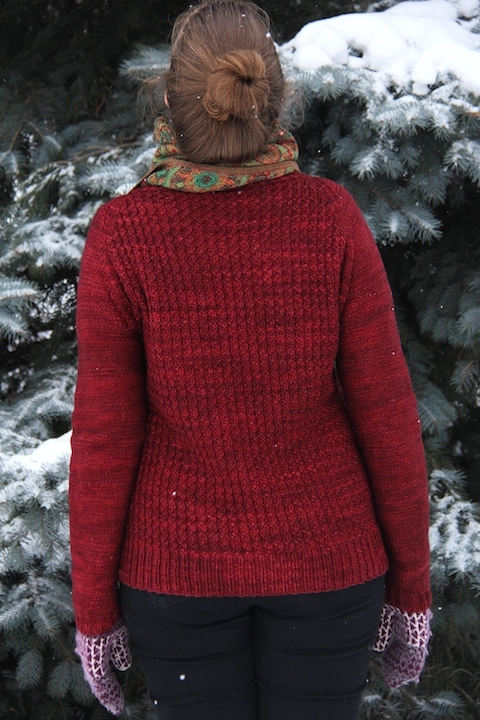 I love the pattern on the back and the colour and the reverse stockinette sleeves look really cool too. Thank you! I love the reverse-stockinette sleeves and must remember to try that on future sweaters. It’s such an easy way to add some extra texture. Your sweater’s lovely and it fits you well. That is just so gorgeous. The color your chose is perfect! That sweater really suits you. I agree that the patterning prevents it from looking like a Tent. It looks like it fits you just right. Thank you! I have been wearing it about once a week since I finished and I’m really happy with the way it’s kept it shape. This is inspiring me to finish up my Bedford! I’m at the raglan decreases. I really wish I had done the extra purl stitch to seam up at the end and add more stability and support! Such a great idea. Great sweater! If you’re only just starting the decreases, you can add them in! Once you stitch up the seam they won’t look like an afterthought. Otherwise, you could add a crochet reinforcement once you’re done. Two 👍s up! It’s lovely. Totally know what you mean about how wonderful it is to wear. I reach for mine all the time and am very disappointed when it is too hot to put it on! Enjoy that beautiful colour – it looks fantastic! 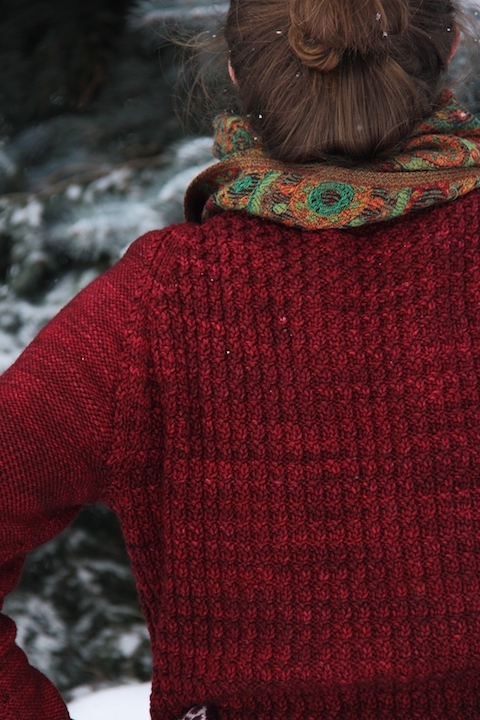 It is any wonder why you have been knitting with red so much lately- it looks fantastic on you! This is definitely one of my favourite reds, I think. Thank you! I have been wearing this at least once a week since I finished it.